This was easily one of my favorite challenges on the list, I really love water marbles! I'm not an expert by any means, I think this is only the third one I've done but I think they are so fun! For this one I wanted to try to do something that I've never done before and I started by painting each nail a different color of glitter and then I marbled over the top with black and clear polish. I do NOT recommend this if you're just starting out marbling as it was quite frustrating! I had to try out about 6 different top coats before I found one that worked well in the water and didn't dry too fast but I managed it! I actually had to dip my index finger twice because the first time there was only a tiny bit of the black on the nail. I think it turned out pretty sweet, don't you? 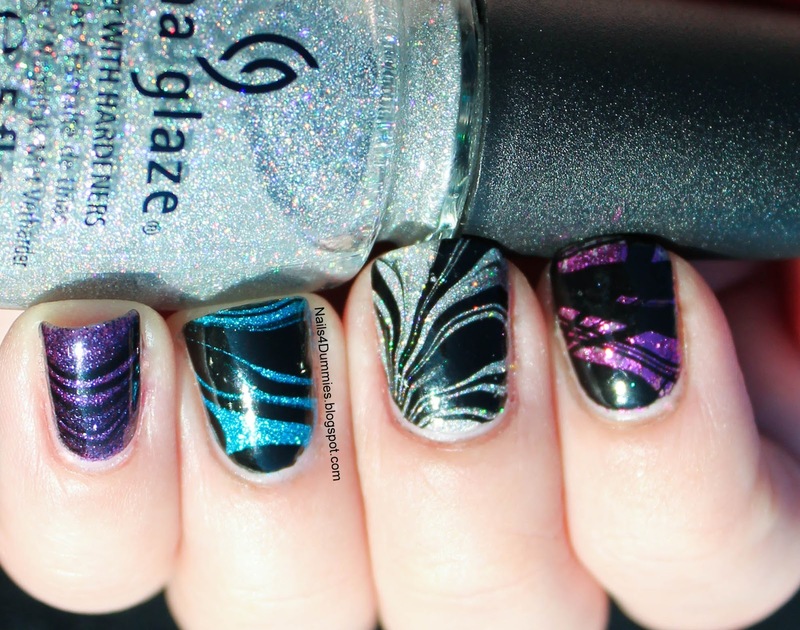 I was pretty proud that I used 4 untrieds on this mani, woo-hoo! Please be sure to check out the other wonderful artist in the Lazy 15 and have a fabulous weekend!!! Oh feck off! ;) Thanks love! Tee-hee! Thank you soooo much! Thank you! 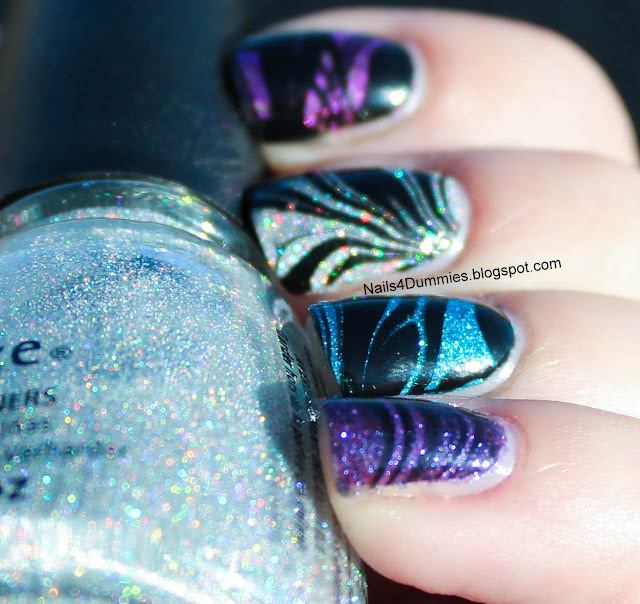 I've seen really cool ones where they do it over a rainbow gradient! Bahahaha! Thank you - u crack me up! I think you actually mad me blush! :D Thanks love! omgggggg this is awesome! You have some skills fo real. Awww, thank you, hee hee! Holy crap on a cracker, that's awesome! Or STUNNING even...sorry am having that kind of day! Lol, I knew what you meant! Thank you so much! 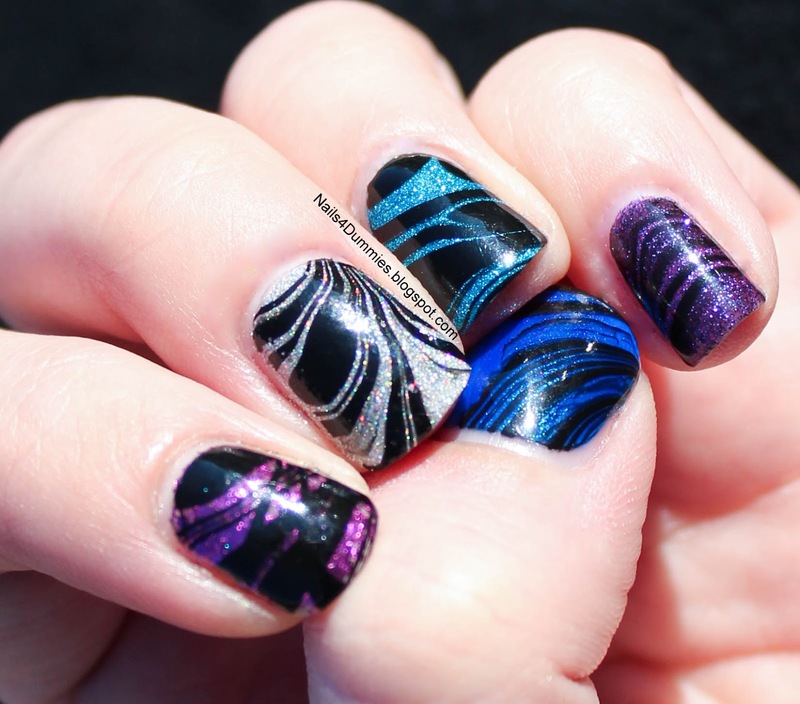 I am far from being a water marble whisperer but I am pretty pleased with how it turned out! Yeah, I LOATHE water marbeling. Can't do it. Just can't. But yours are awesome! I love that you used glitter polishes! This is soo freakin AWESOME!!!! Love! !